There is no formatting standard for JSON and different implementation may produce different outputs. This is little problematic when one need to compare two files as text or store JSON in some kind of version control system - if file was generated with different tool and edited with JSONedit later diff tool would report multiple differences. Although JSONedit has two configurable parameters for JSON formatting: indentation string and string separating name from value in objects this may be not enough to match precisely other tool formatting style. As I don't know how many configuration parameters might be needed - generalized solution seems to be hard to create. 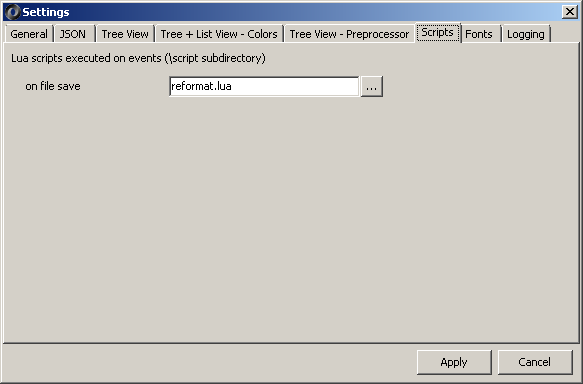 First, unzip jq-win32.exe and format.bat to directory of your choice (with no spaces in name). Update format.bat location in following Lua script. Note: beware that jq outputs empty file if its source file is not valid as JSON. Note 2. Sadly, while jq seems to be most recommended command line JSON tool its Windows support is really poor. In particular it crashes on my PC when used with long file names, i.e. I can convert file "D:\test.json", "D:\test\test.json" but it crashes with more nested directory structure. This seems to be confirmed problem: https://github.com/stedolan/jq/issues/1072.